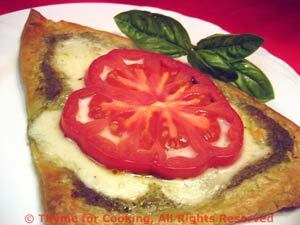 Tomato Cheese Pastries, easy gourmet from Thyme for Cooking. Puff pastry can be used to make easy, elegant starters. Mine comes in a circle, and for this I used 2 'quarters' and did not trim them further into squares or circles. The tomato was a large Coeur de Boeuf, similar to a Beefsteak. Thaw the puff pastry, if needed. Slice cheese 1/4" (.6cm) thick, or whatever works to cover the pastry. Cut the tomato into thick slices. You may need to use 1 1/2 slices, depending on the size of the tomato. Lay out puff pastry and cut it in half. Cut one half in half again, for 2 quarters. Lay the quarters on a baking sheet. With a dull knife (butter knife) lightly etch around the pastry, 1/3" (.75cm) from the edge. Divide the pesto and spread within the etched lines. Lay the cheese on top, cutting smaller slices to roughly fit. Lay the tomato on the cheese. Bake in pre-heated oven at 420F (210C) for 12 - 15 minutes, until sides of pastry have puffed around middle and are golden brown. Remove, garnish with fresh basil and serve.